-There is a good chance it will crit, much like the priest talent Empowered Renew. -Crit procs Nature's Grace (http://ptr.wowhead.com/?spell=61346). -Nature's Grace speeds up the rate at which one can throw around rejuv's, or whatever heal it might be, instant or casted. -This will safely allow resto's to drop a few points in GOTEM - http://www.wowhead.com/?spell=51183 in order to pick up the new Revitalize. -Our crit (much like boomkins) now becomes haste, for both raid healing and tank healing. -Crit and haste are now both valuable stats (with crit in the lead). -Glyphing Rejuv (http://www.wowhead.com/?item=40913) will now grant a ~3500 noncrit/ 5k crit emergency raid heal for a meager 400 mana using http://www.wowhead.com/?item=40342. This is one of the problems that made druids have to decide between rejuv+swiftmend, wild growth, or regrowthing. It will most definitely save players lives. We were already good raid healers, almost on par with shaman Chain heal, I think this will put our position to the top for encounters that have lots of raidwide damage (most Ulduar fights). This and this is how it looks. Spaulders: Unknown yet, but Ensidia has cleaned every boss except Yogg-saron at the time of writing, therefore it's safe to assume the spaulders drop off the one and only remaining boss; Yogg-saron. This comment will probably get downrated over time as the database gets filled and links are being fixed between the items and their respective tokens but if you want the info in the meantime, at least... it's "there". Crit is still better than haste if you have full points in GotEM and ~300 haste or so. This will put you at the GCD cap for lifebloom, rejuv, and WG while raid buffed. While you could potentially stack haste beyond this point and gain a bit of time on nourish or regrowth casts, the average cast increase isn't noticeably different from the increase you would get from Nature's Grace anyway. Furthermore, each crit will proc a full Living Seed, compounding the usefulness of crit. At 3000 SP it will heal for 1940. At 3000 SP it will heal for 1865. So what piece is the matching set for the waist? Looked on both wowhead, armory, and some other sites and could not find the matching piece. Confirmed last night via GM that this item: http://www.wowhead.com/?item=25643 breaks the 4-pc bonus. He said they would fix it soon. um... can someone explain to me what is "Your Rejuvenation spell also provides an instant heal for your target." means ? is it means that the rejuvenation is no longer 12 sec HOT ? Anyone find it wierd that the offset pieces from Ulduar25 match the T8 set instead of the T8.5? I think the current T8.5 should've been the the yellow/green look instead of purple. The matching pieces to this T8.5 set right now are from ulduar10. Does anyone know if the 4-piece counts as a direct heal? For example: http://www.wowhead.com/?item=40258 works off direct heals (relatively useless to druids). My question is, does this 4 piece make me want to think twice about this trinket? If so, this changes druid healing itemization quite a bit trinket wise. Hope someone can answer. Thanks! haha. When I view the 3D model, it's naked at first. That is weird. It is also weird that anyone would ever, in a million years, care enough about their armor matching aesthetically that they would wear bad gear. Even just wearing it around Dalaran is stupid, because then you are parading around in crap gear. So I recently got 5/5 of the set (shoulders and hands are 8.0) and it got me thinking about which one to drop. I know I'm dropping shoulders or gloves. Mimirod has some decent shoulders http://www.wowhead.com/?item=45492. From my research, the chest, legs, and head are best in slot atm. What would be considered the best item to break the 5/5 you say? Well, I think the biggest thing to consider is if you are haste GCD soft capped. If you are haste capped (359 or close) I would get the shoulders. If you need more haste, get the gloves. I recently picked up Rapture http://www.wowhead.com/?item=45234 so I lost a healthy chunk of haste from my main hand and off hand, so I'll probably be breaking with the gloves. •Druid Tier-8 Healer 4-Piece Set Bonus: The amount of healing this set bonus grants on the initial cast of Rejuvenation has been reduced by 50%. In addition, this set bonus no longer has strange interactions with Harold’s Rejuvenating Broach. Feels numbs. First 90% of restodruids (with brains) were passing for T9 since, well, T8-4 set bonus just was extremely superior compared to T9-4 set bonus, just because resto's crit chance just isn't suitable enought to give advantage from T9-4... besides I like more regular flat healing than RNG generated crits, especially on hots. Why do they have to ruin this beautiful set... Tell me! I give you cookies for an proper answer! EDIT: I still probably continue passing for T9 (until getting 4/5 25-Heroic one's), we'll see. Whole set can be purchased from Valerie Langrom in Dalaran for tokens. What did inspire this set? 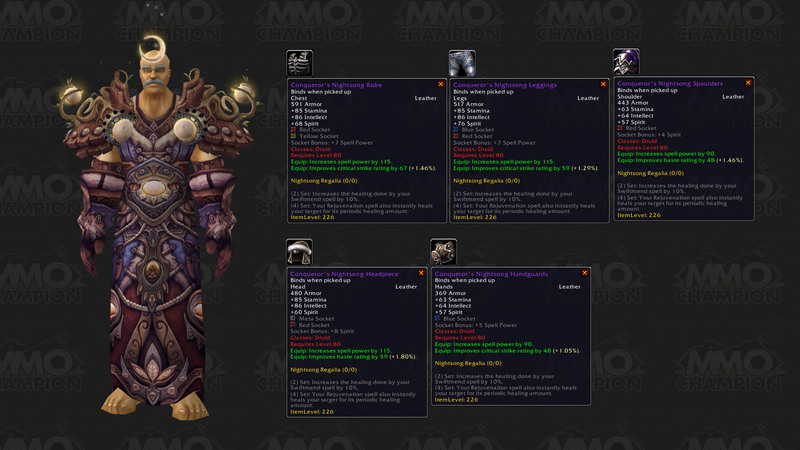 Conqueror's Nightsong Regalia is the Tier 8 Raid Set. It contains 5 pieces. Has set bonuses at 2 and 4 pieces. 4 pieces: Your Rejuvenation spell also provides an instant heal for your target.